Our product range includes a wide range of poultry feed machine, poultry mesh feed plant, layer bird feed plant, broiler bird feed plant, pig feed machine and poultry feed manufacturing machine. 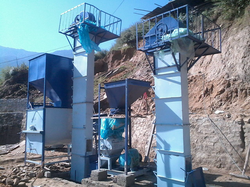 We are the leading manufacturer and supplier of Poultry Feed Machine. Further, these products are highly appreciated amongst our clients due to their high performance. Apart from this our prestigious clients can avail these machines, as per their needs, at highly competitive price. 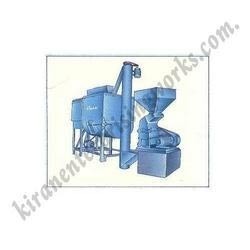 We are the leading manufacturer and supplier of Cattle Mesh Feed Plant for Poultry. 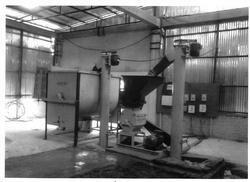 The complete assembly of the plant includes elevator, grinder, hopper, mixer, winch, palletiser, and screw conveyor. The horz. mixer is also started and when, this chamber is empty, the ground material, which is collected in this batch bin above which the mixer is poured into a mixer by a hand-operated mechanical or pneumatic device of this Mixer. When required, this ground material is further poured into a running mixer. The door of this batch-bin is further closed so that where this mixer mixes this ground material further collection of the ground material continues in this batch-bin. When one lot in this mixer is properly mixed, it comes out automatically through the out-let hopper of this mixer and when the mixer becomes empty other batch of ground material is permitted to the fall in this mixer in running condition. Required quantity of molasses and oil, is poured into this mixer, when this mixing process is on from this over-head molasses/oil tank is also provided on the top of this mixer through a hand-operated mechanical device. When the required quantity of the molasses/oil is also poured into this mixer, the out-let of this molasses tank is closed. 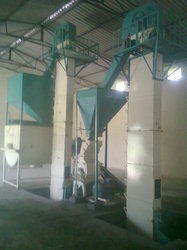 We are leading manufacturer & Supplier of Layer Bird Feed Plants. 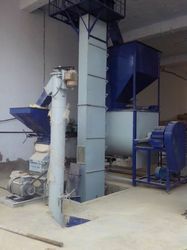 Looking for Poultry Feed Manufacturing Machine ?